I did my first yoga class ever at PYC on Family Day in 2013. My girlfriend had done a few classes and was raving about how PYC was great. At the time, I was a mom of two young children and was trying to establish my career as an accounting professional. With both my husband and myself working full time and many kids activities, life was (and still is) chaotic and making time for myself was not a priority. I was in a place where I felt like I was doing nothing well, life was flying by and I wasn’t keeping up. Taking my girlfriend up on her invite was a first step in making my personal well-being a priority. Yoga has been much more than the physical aspect for me, with the mindfulness being the most impactful. Through the instructors at PYC, I have learned to breathe more deeply, pay attention to how I am feeling, be more reflective, practice self love and think differently. As I progress in my career, the stress level is also increasing. I feel that using what I have learned in my yoga practice has been a key contributor to managing that the increased demands of my career. Yoga has helped me think more clearly, keep an open mind, and be more aware of other people’s perspective. I think differently now, and I am more in tune with who I am and how I am feeling. I am able to keep an open mind when dealing with conflict, and I am more aware of and honest with my feelings. This has allowed me to see things I wouldn’t have seen before and has allowed me to recognize when I need to slow down and breathe. I truly feel that these skills have been key to the success I have experienced in my career. Yoga has also taught me to be ok in the uncomfortable space, whether it is on the mat or working through a difficult situation at work. Challenging myself to stay in the uncomfortable space at work and in some of my personal relationships, and not have to fix it right away or run away from it, has allowed me to grow and deal with obstacles in a different way. I share this concept regularly at work, it has become a bit of a mantra for me. Every time I come to class everyone is so friendly, whether it is a familiar face or someone new. I have never felt judgment or insecurity walking into the studio. I feel like in every class, I learn something new about myself and the time spent on my mat allows me to re-centre and to go back out into life with a renewed energy and positive outlook. I love that the instructors will share how they are feeling and are open and vulnerable to the class. By doing this, they have showed me that it is ok and more often than not we are all going through our own battles in life. In a recent class, Jax shared the concept that you always have choice as to how you perceive something. As an example, she could tell herself that everyone is not enjoying the class because no one is smiling, but instead she can choose to think of all the positive feedback she gets after class so knows that it is nothing personal. This was such a simple concept but her words were so meaningful and impactful to me. I have gained so much personally and professionally as a result of my time at PYC. If someone is reading this and thinks that the class was pretty cool and that they might get something out of attending more classes I want to be able to influence and say come back again! My name is Ashley Burton … and before PYC, I was someone who really didn’t realize who I actually was. I felt like what I did for a living, my culture, age and heritage – all these exterior attributes – made up WHO I WAS. At the time I was living a life for myself really and much less self-aware than I’ve become after diving into the culture of personal development and self inquiry. Power Yoga Canada has profoundly changed my life. 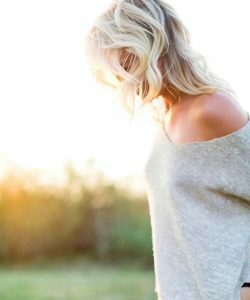 I recently lost my partner at the age of 33 who had an accidental death… which has been by far the most challenging time for me in this life. I didn’t know it all these years but the work I have put in previously has helped prepare me for today. The tools I have learned and my daily practice have enabled me to manage the rollercoaster rides that come my way. There are highs and lows; through self-inquiry work with PYC, when there are lows, I know what to do to work my way back to a place where I feel powerful and present again. I’m more compassionate with myself, more forgiving with my family and friends. I’ve learned how to really listen, not only to others but also myself. I remember being in traffic pre-PYC or at the lineup at the bank feeling anxiety and tension run through my body. Today I’ve learned how to calm down, how to really breathe especially during the challenging moments I experience. I love being a part of the PYC family because I feel completely supported in every way. I believe in how lives are impacted because mine has been; and for that I will forever share PYC with everyone in hopes of their transformations as well. I want to share my story because of YOU. Yes, you reading this… that you know whatever it is you’re going through in your life, coming to this place is the best thing you can do for yourself. Show up and trust this process. I promise you will discover something beautiful along the way. “Get a real job” someone said. I have experienced this personally, but I have also heard it said to my fellow teachers. The conversation around teaching sometimes shows up like, “I teach 4 classes a week but my real job as a financial analyst.” If teaching yoga is a second job for some, why does it take the back seat in conversations? Most likely if it’s a second job, it’s because it fuels part of us that we don’t have access to at our full time job. Does it mean teaching yoga is not a real job? I think opposite. I’d be lying if I said I never have stepped back and questioned what am I doing this all for. Maybe they are right? Maybe the corporate life I had before is THE way. Maybe I need to find my happy with money being the primary driver instead of my purpose? I start feeling doubt and anxiousness when I forget my feet are planted in right here and now. Building. Rebuilding. Connecting. Learning. Growing. Rome was not built in a day. “Get a real job.” someone said. This is my calling. If I build it, they will come. Landing a job that pays is easy. Landing a job that aligns with your passion, requires a thirst for action, a yes for patience and a whole lot of courage. Is all of THAT possible? I would have had a different answer a year ago. Today, I can confidently say YES IT’S POSSIBLE! To all my yoga teachers who impact lives, that is REAL. To all those who have rolled out their mats and have been left inspired, that is REAL. To our favorite teachers that really see their students and are of service to us, that is REAL. To the times when my mat was my saving grace, that is REAL. I teach yoga. I teach too many or to one. I know almost every single students’ name and if I don’t, I make sure I remember them after that day. You want to know why? Because it matters. Because connection is very REAL for me. It causes miracles and I am witness to it everywhere in my life. Right now in my journey is looking at what I am and what I am not to find what’s real. And what I AM is ready to align my career to my higher calling with whatever it takes. No one else will have as much of an interest in living out YOUR dream but YOU. What are you waiting for? Make the higher call. You got this! Before I ever stepped into yoga studio, I was someone who was constantly busy. I worked two jobs while attending university, maintaining a jam packed schedule, living with 7 boys and in a toxic relationship. Two years later I found the courage to leave the relationship, but I don’t even think I had time to pause and give myself the permission to shed the weight of my abusive relationship. My MO was a very active and busy lifestyle, so I just kept going. One day with my new partner at the CNE, I had a severe panic attack for the first time. It came out of nowhere and I didn’t know how to handle it! Thankfully he eased me out of it and I am grateful I was not alone. Attacks came periodically, so I went for medical tests – everything came back normal. I was diagnosed with a minor anxiety disorder and was given two options: pills or yoga. I was resistant to both! I felt pills would mask the problem and yoga was too slow and boring for me…My entire life revolved around active sports and now I was supposed to sit on a mat and do some slow stretches? Thank you, next. I went home to tell my parents and it just so happened that Power Yoga Canada had just opened up behind my Dad’s shop, Clarkson Fine Cars on Clarkson road. My dad bought me a pass and encouraged me to use it while my car was being fixed that day. I was resistant with every bone in my body but I decided to listen. I met Kinndli and Pauline who right away made me feel like I was part of the PYC family. I don’t even think I had proper yoga gear that first day but their persistence made it difficult to say no to taking the next class. I took a spot in the back corner and had zero idea of what I was getting myself into. All I knew was that it was SO HOT and how the heck was I going to breathe?! I made it through the class not knowing a single pose and still left the studio feeling like a BADASS! That night I had the BEST SLEEP EVER! I went back the second day wanting more of what I knew nothing about. I signed up for the 40 day to Personal Revolution and little did I know that decision would forever change my life. The anxiety vanished, I slept like a champion, I was more present in my body and with my family and friends. People kept telling me something changed in my energy but they couldn’t pinpoint what it was. I wanted more. In 2012 I joined PYC’s first intensive two week teacher training program. I started teaching at my corporate finance job twice a week and implemented yoga into my condo community in Toronto which were both successful! Two years later I moved to New York City and completed Level 1 & 2 training with the Baptiste Institute. I managed and taught at Lyons Den Power Yoga, Manhattan’s only Baptiste Power Yoga studio. 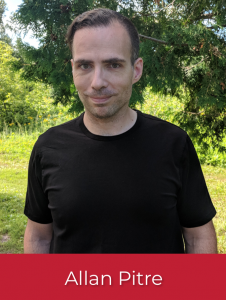 I have moved back to Oakville and have decided to leave the corporate world all together and devote my passion and energy into yoga full time. Although it is inspiring and fulfilling to do what I love, I took a big pay cut from what I was earning in finance. I have stayed positive throughout this process and trust that the abundance of money always comes from when passion and drive are in alignment with our work. This is my calling. If I build it, they will come. Landing a job that pays is easy. Landing a job that aligns with your passion, requires a thirst for action, a yes for patience, and a whole lot of courage. Is all of THAT possible? I would have had a different answer a year ago. Today, I can confidently say YES IT’S POSSIBLE! Life has certainly been moving very fast for us. 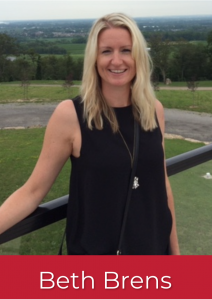 Looking for a release from the stresses of work and living in the big city, Allison stepped into the PYC studio in Oshawa and immediately felt welcomed into their community. The sense of belonging was so great that she practiced there every day bright and early at the 6am class before heading to work. The transformation had begun! 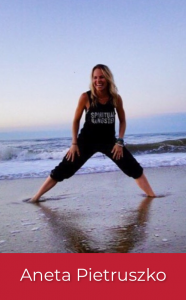 Only a year later, Allison took the next big step in her development and attended the summer intensive teacher training and learned how to light up a room! Seeing how awesome the transformation was in Allison, and wanting to be supportive of her new adventure, Grant agreed to give this yoga thing a try. The physicality of the practice was addictive and the results were amazing! 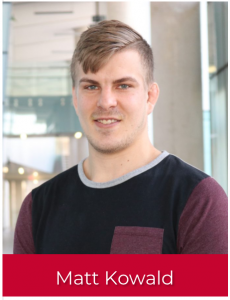 Grant signed up for the 40-day program and followed that up right away with the assisting intensive course. Taking the teacher training was the next obvious step. While all of this was going on, Allison’s mom was diagnosed with lung cancer. Part of her lung was excised but the cancer has returned and we are continuing our fight. Allison’s family all live up north in Sudbury. With this news, we decided to make a plan to leave the south to be close to the family. We wanted to be able to spend more time with Allison’s mom and also be with the rest of the family and help out where we could. Fortunately, our shared love for PYC propelled us towards this goal and we embarked on our quest to empower the Sudbury community into action! It isn’t easy uprooting your family. Our two daughters, Ginny (13) and Charlotte (12), have been very supportive in our move. This is a big change for them having to leave their school and friends. They are looking forward to helping out at the studio and maybe even becoming teachers themselves one day! Moving houses was a giant ordeal, especially considering that Grant was off at teacher training a week prior to move day. In addition to changing where we live, Allison is also leaving behind a 20-year career as a dental hygienist to pursue this new beginning and be immersed in every part of our studio build and operation. We have been very fortunate to have our family around to support and assist us with opening the business. 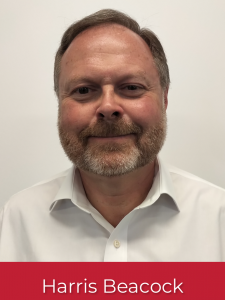 They have been there with us every step of the way – helping with advice, painting, plumbing, flooring, electrical and even contract negotiations! They have been great ambassadors for us and have been spreading the word of our opening through their vast network of friends. We couldn’t be more appreciative of them for helping us make PYC’s most remote studio simply awesome! We are filled with joy and gratitude to be near our loved ones and to be able to take part in family life and are so looking forward to getting to know our community and flow and grow together! I walked into Power Yoga Canada in Leaside about a year ago. I had tried Bikram Yoga at a nearby studio in 2015, actually staying with that practice for almost a year, but the 90 minute classes were simply too much of a time commitment to allow me to continue my practice. Fast forward 2 years to the Fall of 2017. I weighed 238 pounds, was moving toward being diabetic and was not very active at all. Although my career is not exactly physically demanding, as I sit at a desk most of the day, mental stress is a definite factor. My only physical activity consisted of walking my dogs – on its own, it was not conducive to being truly healthy. I had noticed the Power Yoga Canada sign on Laird and decided to drop in and see what it was all about. I liked the concept of hot yoga, as I have always thought that a good sweat was good for a person. The first practice was a definite contest to stay with the flow, but I felt terrific after the class. I was hooked! From there, I started slowly, finding it challenging to do 3 classes a week, but sixty minutes is a manageable time commitment and the classes provide a total body workout, as well as a great mental flush! Fast forward to now, a year later. Combining my practice with proper nutrition, I have dropped 24 pounds, reducing my body fat from 29.7% to 20.5%. I have improved my physical fitness to the point where the classes are still challenging, but I get through them and the after-class buzz is well worth the effort. 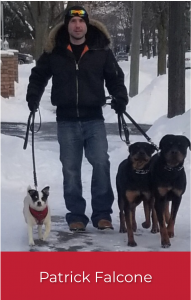 Walking my dogs is no longer a challenge. I sleep better, have a clearer head at work and home and I always look forward to the positive reinforcement that I get from the instructors and fellow yogis. My goal is to continue to practice at least 4 times a week and I have begun attending Sunday yin classes for variety. Perhaps there is 40 Day Challenge in my future! I have found the instructors and my classmate to always be positive and helpful, from taking someone who is really new into their classes to offering hints on how to continuously improve my practice. The constant positive reinforcement from everyone has been extremely helpful with my yoga journey. I want my story to act as a motivational point for anyone who thinks that they can’t change their situation, be it mental or physical. It can be done! Initially, One of the reasons yoga intrigued me was that I had heard it was beneficial in healing the body from injuries. I have a bad back and problems with my hips, knees, and shoulders; being that I’m extremely accident prone and clumsy, many of these are self-inflicted. I frequently get low back spasms and my body is generally very tense and sore, and feels way older than 40 years should. I’ve struggled with my weight since my teens, there was definitely a correlation between my weight and worst bouts of depression. I’ve dropped 115 lbs. through consistent exercise, a strict ketogenic diet, and intermittent fasting. Losing weight has improved the way I feel emotionally and physically, but years of additional weight has compounded my injuries. Because of these injuries, some of the workouts I used to enjoy are no longer an option. Last winter, I reduced exercising and picked up some bad diet habits. I gained weight, and started to get a bit down on myself. Before things got worse, I recommitted to my diet and exercise regimen. 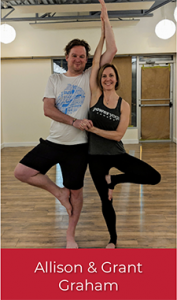 My wife and I decided to try yoga and support each other through the experience since we were both apprehensive. I don’t know that I would have worked up the courage to start alone, and I’m grateful for her support because the past 5-1⁄2 months have been transformative. I was so nervous for my first class at PYC City Centre. I did not know what to expect. I was concerned about being judged because of my body, because I didn’t know the sequences, or when I couldn’t hold a pose. Instead, I found a supportive community of amazing people who have literally bent over backwards (pun intended) to make me feel welcome and accepted, and without even having an inkling of how intimidated I was those first few weeks. I have become completely enamoured with yoga. It’s amongst the most physically demanding activities I have done, yet I feel incredible after. I actually look forward to my next time on the mat. I won’t pretend that yoga has fixed my body, but it has absolutely made a difference. Every day I feel stronger and continue to surprise myself with what I can do. I recently completed a 21 day challenge and it was one of the proudest accomplishments I can recall in recent years. The best part of the experience has been the community and feeling like I belong here. There have been many encouraging and inspirational words spoken by the awesome team of instructors at PYC City Centre, but for me, the ones that most resonated are “…the hardest part of your practice was showing up on your mat, and you already did that!”. I couldn’t agree more. Just show up for practice and amazing things will happen! 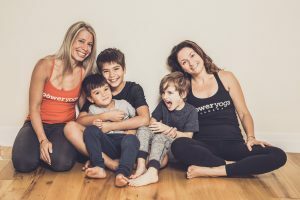 As we approach our 10 year anniversary, it has become so clear that Power Yoga Canada would not be what it is without YOU! We have moved together, we have cried together and we have lived together in and out of unison. Well, we need your support once again. We are spending the next year putting together all the stories of PYC. What have you learned? What have you shared? What do you want the world to know? What photos do you have and what memories do you never want to forget? Do you have a paragraph? Do you have a quote? Do you have a recipe or an accomplishment that would have not happened had we not met on our mats? Storytelling and sharing allows us to keep our stories alive, so if you have something please share it. We want to hear from you send whether you have been with PYC since day 1 or whether our paths have just crossed – we need to hear from you! Wherever you practice or don’t practice, wherever you are in the world please send us whatever inspires YOU! Wanna share on social? Tag us & use the hashtag #pyclife and we will use as many as we can. Mother Theresa said, if you want to change the world, go home and love your family. Thank you for being our family, together we have been changing the world, we are forever grateful & we are all just getting started!!! Release your self-imposed limits. Be grateful. This is the wisdom I have learned to live by. Let me explain…I have experienced some turbulence in my life. I was nine when my mother was murdered by my step dad, changing my life and support system forever. I initially moved in with my grandparents. As I got older, I was sent to a public boarding school and was surrounded by troubled youth. I became angrier and more confused with the world. My grandmother passed away, and I lost another person in my life. My grandmother’s passing hit a switch inside of me; the light in me disappeared, allowing darkness to enter. I gave up on life. I woke up in a hospital room the next day, and a veil of regret stuck on me like a wet blanket. Moving forward my mind state shifted to a positive one as I began to understand and treasure the small things in life. I slowly discovered yoga, meditation, mindful movement, and how to forgive past grievances that I held on to. I discovered the power of gratitude and changing the “I have to” tasks into “I get to” tasks. This simple mind shift had a profound impact on my outlook, allowing in more light than I knew was possible. In 2015, I booked a one-way ticket to Canada for university. Missing the heat of Australia, I jumped into a hot power yoga class at PYC St Catharines for the first time. The experience was incredible-I had practiced yoga before, but never in a hot room or with a dedicated community. The experience helped me find focus in my mind, my body and the present. These moments on the mat translated my life. It encouraged me to write a letter to my step dad letting him know that I forgive him, allowing me to move on. To be gentler on myself, and take note of the small things. This is why I wanted to add a space to forgive something each day, to continue letting go of things that are easy to hold onto. The lessons I learnt from these obstacles have helped me grow so much. Remembering to breathe, to move, to love, to laugh, to smile, to forgive, to be compassionate, and to treasure the moments in everyday is what saved me. 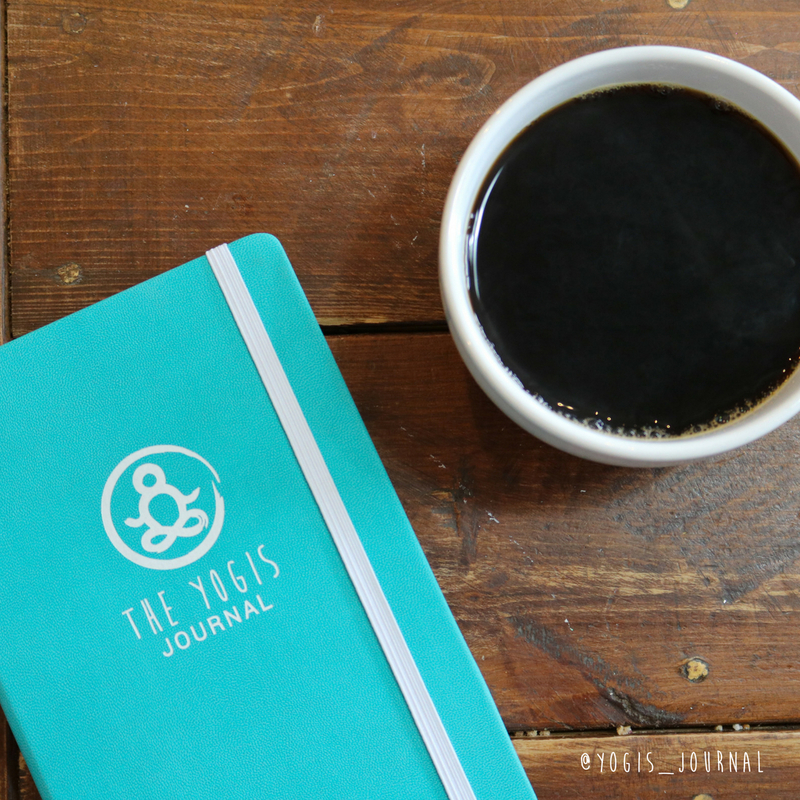 Through the struggles I have experienced in my life, I was inspired to create The Yogi’s Journal a guided journal that combines elements that have helped me grow in my yoga practice. Taking those tools that I accumulated throughout my life, I wanted to create a written structure, as I often find it easy to forget to do the little things that have helped me and many others. Bringing the idea into fruition I reached out to Laura (a friend and yoga teacher in England) and began bouncing ideas as we began to shape the idea. Then reaching out to Siqouia a graphic designer to add flare, and Jess to help spread the word. Through brainstorming and many talks we created a guide for ourselves and you to foster an explorative and healing practice. 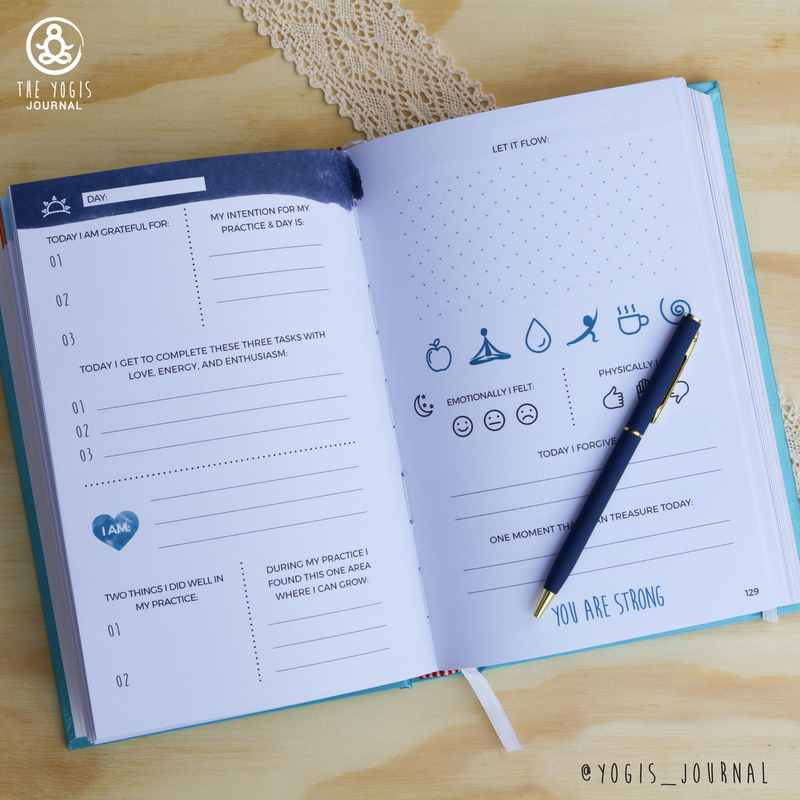 The journal guides you through everything that has helped us on our journeys, and what we have learned from yoga, starting with guidance, ideas and inspirations into the eight-limbed path, gratitude, forgiveness, setting goals that resonate with you, creating morning rituals, and the yamas and niyamas. At the beginning of each week you can set your focus, steps towards your goal, and ideas on how you are going to incorporate the yama or niyama into your week. A friendly challenge, and some asana, meditation, and pranayama inspiration. Each day there’s a structured page where we can start the day with gratitude, set an intention and write down three tasks the we get to do today! There’s a space for affirmations, reflection on your practice, to forgive, and a spot to write down the moment that you can treasure. Ending the week we gave ourselves some space to reflect, including how you moved towards your goals, how the yama or niyama affected you, what challenged you, what enriched you, and how present you were.